Officially known as the new phantom, the phantom i succeeded the 19-year-old silver ghost in 1925. (though the old model remained available for some time). The main difference between the two was the adoption of an overhead-valve engine that drove the transmission through a plate dutch instead of the earlier cone clutch. Better acceleration although the phantom i had better acceleration than the ghost, its chassis lacked rigidity, particularly with the adoption of front-wheel brakes. There was also a tendency to develop body roll, which made the rear seat distinctly uncomfortable at high speeds. The production run of the phantom i was accordingly short in 1929, it was replaced by a new chassis, the phantom ii. american subsidiary in 1919. 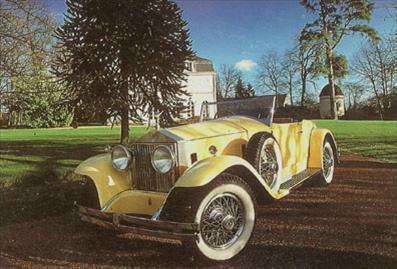 Rolls-royce had formed an american subsidiary. The idea was to increase sales by avoiding the high customs duties placed on imported cars. Both ghosts and phantoms were built at the rolls-royce factory in springfield, massachusetts, and the majority of these cars were bodied by brewster, a leading.new york coachbuilder purchased by rolls in 1926. But when the phantom ii was launched in 1929, springfield could not make the changeover. American production ceased in 1931. This 1926 phantom i was actually built in england but bodied in new york by brewster for paramount pictures.